Featherweight champion Max Holloway and No. 1 contender Brian Ortega expect to face off several times in the future no matter the results of UFC 231 on Saturday night. As much as rankings might seem to matter, it’s actually not all that often that the champion will always face the No. 1 contender in any given division. This weekend at UFC 231, featherweight king Max Holloway will take on the clear cut No. 1 contender in Brian Ortega in the main event from Toronto. 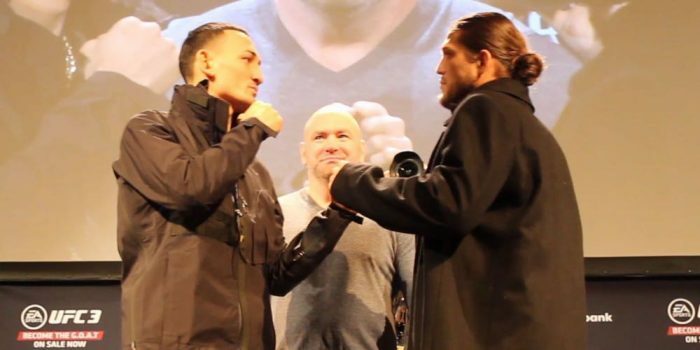 The fight between Holloway and Ortega isn’t just a showdown between champion and top contender. Instead, this is a fight that pits a dominant champion in Holloway, who is currently riding a ridiculous 12 fight win streak, against an undefeated challenger in Ortega, who has managed to take out a pair of top five fighters (Frankie Edgar and Renato Moicano) on his way to the main event on Saturday night. That’s why Ortega believes that this fight will just be the first of many where he’ll see Holloway standing across the Octagon from him with a UFC title on the line. “Yeah, he ain’t going nowhere and neither am I and there’s no more room at the top,” Ortega said at the UFC 231 pre-fight press conference. “Like I said, no matter what happens I don’t see him going down and spiraling down in a crazy thing, neither do I see myself. Obviously, Holloway has no intention of handing over his title to Ortega this weekend but he respects the undefeated Brazilian jiu-jitsu black belt from Los Angeles. Ortega has absolutely earned his title shot and Holloway feels much the same way that they’ll probably cross paths again in the future. In fact, Holloway even adds that this rivalry may extend beyond one weight class as they get a little older and pack on a few more pounds. All jokes aside, Holloway and Ortega have clearly defined themselves as the two best featherweights in the division right now and they will clash with the title on the line on Saturday night in the main event at UFC 231 from Toronto.